Using plasmas, sealed plastic bags can be modified at atmospheric pressure so that human cells can adhere to and reproduce on their walls. Cell culture bags of this kind are an important aid for research and clinical purposes and may eventually replace the Petri dishes used today. Physicians are increasingly using live cells in their treatments: in blood transfusions and bone marrow transplants, as well as in stem cell therapies and following severe burns. Cells taken from the patients themselves are ideal for replacing burned skin, eliminating immune deficiencies, repairing degenerated cartilage or to treat injured bones as they are not rejected by the immune system. These cells have to be kept, cultivated, reproduced or even modified in a patient-specific manner. The problem, however, lies in the storability of the cell solutions used. As they can easily become infected by germs, they can only be stored for a few days in the containers conventionally used today. The joint project InnoSurf aims to remedy this problem: scientists from five research institutions, along with partners in the industry have developed innovative plastic surfaces and measuring methods for efficiently producing human cells for diagnostic and therapeutic applications. The work was coordinated by the Helmholz Centre for Infection Research (HZI) in Braunschweig, Germany. The idea is to cultivate the cells in sealed, sterile plastic bags. The inner surface of the bags has to be modified so that they provide cells with good conditions for survival. A team led by Dr. Michael Thomas at the Fraunhofer Institute for Surface Engineering and Thin Films IST in Braunschweig, Germany, has now developed a plasma technology process for use at atmospheric pressure. We fill the bags with a specific gas mixture and apply an electrical voltage explains scientific assistant Dr. Kristina Lachmann. Inside them, for a brief period, plasma is created, i.e. 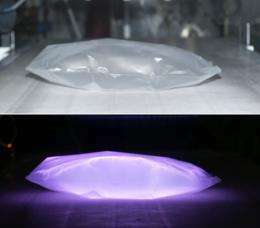 a luminescent, ionized gas, which chemically alters the plastic surface. During this process the bag remains sterile as plasmas also have a disinfecting action. The advantage of the process is that it operates at atmospheric pressure and is therefore cost-effective, fast and flexible emphasizes group leader Dr. Michael Thomas who specializes in the use of such atmospheric pressure plasmas to modify surfaces. The new bags facilitate the sterile handling of cell cultures. Previously, researchers and clinicians had to use open Petri dishes, bottles or bioreactors. As these systems need to be opened, at least for filling, contamination can easily occur. By contrast, when using the new technology with its sealed bag system, the cells migrate directly into the bag via an injection needle or connected tube systems without coming into contact with their surroundings. The sterile interior of the bags contains nutrient medium and germ-free air or a suitable gas, which been added beforehand. Even during the cultivation period the containers do not have to be opened, and at the end the cells can be removed again by injection needle. The researchers also maybe intend to use the disposable systems for growing artificial organs. If the bags are provided with a three-dimensional structure, cells could attach themselves to it and create artificial skin, nerves, cartilage or bone which could be used prosthetically in the patient. So far their cultivation has mainly failed because the stem cells have been reluctant to attach themselves to spatial structures. The plasma process developed at the IST could solve this problem. In collaboration with the University of Tübingen, Braunschweig City Hospital plans to isolate certain stem cells from tissue samples and investigate on which of the new plastic surfaces they could develop into bone or cartilage, for example. For this development by the group led by Dr. Michael Thomas, the IST was awarded Selected Location 2011 as part of the Land of Ideas initiative. The prize will be awarded at the IST in Braunschweig on December 8, 2011.